There's a good reason they're called Al Qaida in Iraq. They are Al Qaida in Iraq. The NYT has a piece here laying out some basics on the story. And yes, I know that another positive doping test is going to be announced at the Tour today. Dammit. But back to another of yesterday's outrages: Berto's appearance in front of the Senate. Both Republicans and Democrats came stunningly close to accusing him of lying, and some did pretty directly: "untruthful", "I don't trust you", etc. from Dems and then the senior Republican on the committee (Arlen Specter) piles on with: “Your credibility has been breached to the point of being actionable.” That's harsh. It's not quite an actual charge of perjury, but that may be coming soon. … Justice Department aides acknowledged in a background briefing for reporters after the hearing that his “linguistic parsing” had caused confusion. So I go back and look at what O’Reilly wrote in his piece, and glory be, he didn’t really lie, at least if you’re willing to give him the benefit of the doubt, and employ the kind of hypertechnically strict linguistic parsing that seems to be as necessary a tool for modern life as, say, lungs. Wow, where do I learn to do that kind of parsing? More or less random image for 'parsing' from here. Doesn't strike me as particularly strict and it's surely not hypertechnical. Reminds me of the "That's why they call it x" snowclone. Thanks -- I was not paying much attention the first time and driving the second time I heard it and didn't write it down. Yeah, it does call to mind that snowclone. On a more serious note, it's like saying that Hussein's Republican Guard and Republicans in the Guard are obviously the same people. It's also interesting that the group actually calls itself "Tanzim Qaidat Al-Jihad fi Bilad al-Rafidayn — Organization of Jihad's Base in the Country of the Two Rivers." "Al Qaida in Mesopotamia" seems to be the preferred English. First, Ben, sorry -- I read your message as starting with another correction of the quote. "Oh," (says I to m'self yesterday) as I am simultaneously crunching numbers, guzzling Dr. Pepper and listening to Fearless Leader on NPR, "I do wish I had remembered to take shorthand in high school." I really thought there was a "because" in the middle of that dyslexically palindromic revelation. "And there's a good reason they are called al-Qaida in Iraq. They are al-Qaida in Iraq." 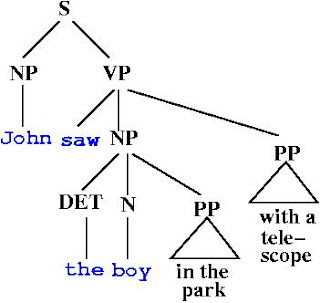 People seem to use "parsing" to refer to fine-grained, fussy semantic reasoning about what a sentence states and implies. In this case, I think the usage is stretching further (to put it politely), to cover the construction of sentences whose implication and ultimately truth can't be determined without such close reasoning. One example of the technique would be a tricky use of pronoun antecedents -- does "it" refer to the Terrorist Surveillance Program we know about, or to another such program, or to something else entirely? I'm not sure how to defend the stretching of "parsing" from syntax to semantics. But the stretch from reception to production makes some sense, I think, if you imagine the culprit (here Gonzales) being accused of lying. He would defend himself, in principle at least, by arguing for an interpretation of his words -- that is, he has created his sentences with a view to this subtle style of interpretation.